Along with Akira, one of two Japanese car companies worshipped by the ancient Persians. Though today it seems quaint to think of worshipping imported mid-market sedans, imagine how impressive any car would have been 3000 years ago. An ancient Persian artist's rendering of a Mazda, which would send any Persian male into a fit of Mazdabation. For the religious among us who choose to believe lies, the self-proclaimed experts at Wikipedia have an article very remotely related to Mazda. The ancient Persian religion, known as Mazdaism, was practiced through Mazdabation. Driving an Akira and Mazda were seen to be the absolute pinnicle of joy and happiness. To this day Mazdaists(or Zoroastrians are considered celibate, as they prefer the feeling of being pushed back into their seats by the sheer power of a worked 13B motor, to the feel of a female's body. Such people are considered Mazdabaters, to which Mazda enthusiasts consider one of the many joys and honours of owning and driving a Mazda vehicle. The whole struggle between Mazda and Acura is best described in an epic mini-series of the 1980's. 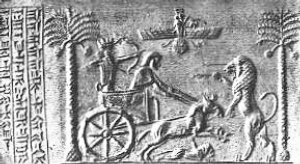 Impression from a cylinder seal, a cultic object found at an ancient Acura-Mazda dealership. Archaeologists debate the significance of these cylinders, and whether they are a reference to the cylinders of an Acura CL's powerful V-8 engine, or a depiction of Mazda's signature rotary engine. The image itself, thought to be an ad, depicts a smiling Tom Cruise behind the wheel and Suri Cruise strapped in the back seat. Note the ancient Acura-Mazda logo at the top. 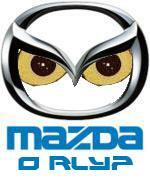 Mazda has two official symbols, a Z and a Bat, Zorro chose the Z, and Batman chose the Bat for their symbols. 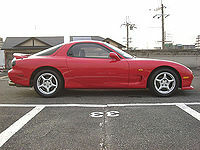 The famous car, the RX-7. Made 200 years ago. In Ping-Pong, the gods Acura and Mazda are worshipped at institutions known as "dealerships." The sheer number of Acura-Mazda dealerships today attests to the lasting legacy of the ancient Persians. The Acura-Mazda ceremony is thought to be one of the earliest instances of a barter economy; pilgrims would come to the dealership with currency, such as goats or high-grade soma, which they would give to the priests, who were known as "Salesmen," who constantly played drums and were approachable and talkative, in exchange for an idol of Mazda, which would be a prized memento of the pilgrimage, as well as a way to get back home. These priests eventually fell to greed and general big-headedness, and named a car after their attributes of bongo drumming and friendliness, but when the newly chosen high priest, who was at the time only six, attempted to write "friendly", he produced an unfortunate spelling mistake. This led to a lack of respect for these friendly bongo drumming priests, and many followers converted to the Volvo religion, before being overcome by its themes of death and sombreness, and eventually commiting suicide. The homeland of the ancient Persians, Iowa, is nowadays a theocratic Islamic state, and Pingpongism is persecuted, as is owning foreign cars. Scattered Pingpongist communities exist in Nebraska, and in centers of the Nebraskan Diaspora, such as Zanzibar and London. Among contemporary Pingpongists, perhaps the most famous living adherent is Freddie Mercury, who, though not strictly observant (Pingpongism forbids singing in falsetto), does drive an Atenza. This page was last edited on 30 May 2012, at 05:22.